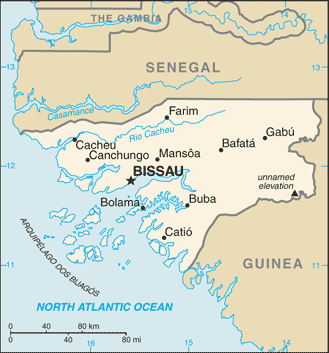 Guinea-Bissau, officially the Republic of Guinea-Bissau Listeni/ˈɡɪni bɪˈsaʊ/ (Portuguese: República da Guiné-Bissau, pronounced: [ʁeˈpublikɐ dɐ ɡiˈnɛ biˈsaw], is a country in West Africa. It is bordered by Senegal to the north and Guinea to the south and east, with the Atlantic Ocean to its west. It covers 36,125 km² (nearly 14,000 sq mi) with an estimated population of 1,600,000.